Man, 2017 is already so last year. Way, way back in the distant past of 2016 I told you all about the 21st Century Typewriter. In that post, I recommended getting yourself a tablet​ with a bluetooth keyboard. It's pretty portable, and pretty flexible, but guess what? Unless you want to pay out the big bucks for an iPad, or you're crazy enough to want a Windows tablet, you can't have Scrivener, as there's no version of it for Android. This rules out most of the best value tablets on the market. 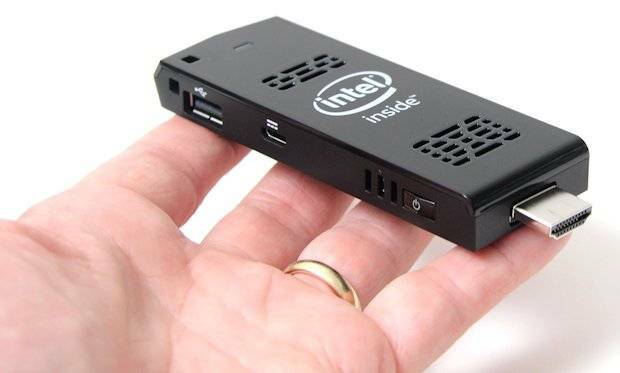 ​You are looking at the Intel "Compute Stick." Released in mid 2015 it caused quite a stir among techies and the IT press and everyone had a lot of cool ideas for what to do with it. And a lot of people overworked the poor thing. It's very small, and it gets hot. So there were quite a lot of unsatisfied customers who were disappointed that they couldn't play Call of Duty or stream UHDTV on it. If you have no idea what I just said, your the right person for this device. Why? It's a Computer. You're a writer. You need one. To write on. To do a little light research. To keep up with your social media. All the stuff you do on a computer. There's a great article over on Digital Trends​ all about the new offerings in PC Sticks for 2017. You can read it if you want to, or you can just use it to follow the links and buy the device of your choice! ​Mike on his laptop, poor lamb. But I hope you aren't sitting at a desk with a massive, whirring humming thing under, on or behind it somewhere. At least if you have a desktop let it be an all-in-one like the HP 22 b050 (below). Hint: the computer is built into the screen. It's kinda nifty. But not very portable. ​So this is a tiny, lightweight portable computing solution for less than $400. Your portable monitor must have an HDMI port. 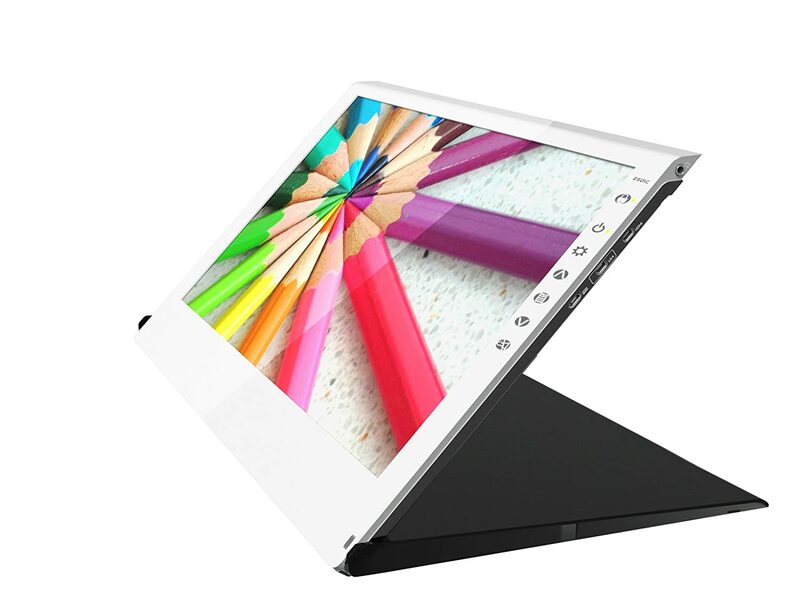 They are available in various sizes, and you can even get a touch screen portable monitor if you want to spend even more money. The GeChic 2501C is pretty practical (below). Go straight for Bluetooth. Most PC sticks have only one USB port and you can't be clogging that up with the dongle of your wireless keyboard. You have two choices - if you expect to be working on a flat surface most of the time, a Bluetooth keyboard and separate Bluetooth mouse​ are a good choice. For more portability, choose a Bluetooth keyboard with a built-in trackpad. What's wrong with a laptop? People do sometimes ask me this. It's about the science of ergonomics, and the art of comfort. Posture and vision specialists tell us that the screen should be level with the eyes - your eyes should be at a height somewhere above the middle of the screen. The keyboard should be on a flat surface, and itself as flat as is comfortable for you. If (like me) you learned to touch type on a mechanical typewriter) you might want to be able to rake (tilt or incline) your keyboard a little​. These little but necessary adjustments are not possible on a laptop, and working for long periods on a laptop is difficult and uncomfortable for many, many people. A portable monitor can be mounted on a tablet stand or a tablet arm when at home, and propped up or stood on its built-in stand when out and about. But bear in mind the PC Stick can be plugged into any screen with an HDMI port, including televisions.​ So you can PUT SCRIVENER ON YOUR 50" TV and type on your sofa. ... of some retailers who have already seen the potential in this set-up and are offering bundles. Literary Editor, Creative Writing Coach and Teacher. If you want help of any kind with your book, you may contact me here. Sign up to my mailing list for regular information on course, live lessons, webinars and promos. © 2018 Harry Dewulf - All Rights Reserved. regardless of genre. Sign up for the Dewulf Bulletin and get your copy of the A to Z checklist today.